“I do not think I would have achieved a perfect score without Test Masters. My favorite part of Testmasters was probably the teachers. The teachers were incredibly engaging and made fun competitions to keep their students interested. They also knew what they were talking about and had fun anecdotes to share. Andrew, as a student at Memorial High School participates in the Lincoln-Douglass Debate style, Academic Quiz Bowl Model UN, and UIL Literary Criticism, among other clubs and activities. His favorite pastimes include reading, playing video games with friends, and researching philosophy. 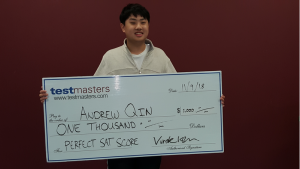 In recognition of Andrew’s accomplishment, TestMasters will award him a $1000 Perfect Score Scholarship.